Discerning your future, your career, and all the in between is hard, messy, stressful, and can cause tears, anger, confusion - or all three. But there are many good things to graduating high school, going into college, graduating college and doing life as an adult. It's more then adulting - it's fulfilling the purpose God has given you. 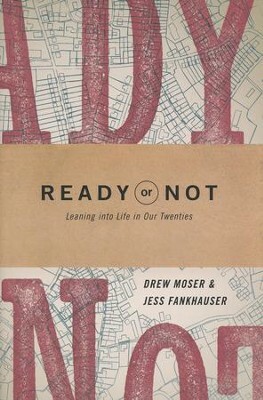 I'm not quite at the 'twentysomething' phase that authors and mentors Drew Moser and Jess Fankhauser talk about in "Ready or Not." I've already bypassed college itself and I'm in the, "who am I and what is my purpose," phase again that I was back in High School. I'm where most college graduates are: What next? Am I doing the right thing? I'm making decisions and being an adult, regardless if I'm over 21 or not, and I needed this book - and so do you! Being an adult isn't just 'adulting' - it's a beautiful yet hard process and the authors equip us with plenty of humor, true stories from their own lives and most importantly: scripture and the reassurance that we are not alone. Lots of tears and hugs. I appreciated Drew and Jess giving us some insight in this crazy world, for giving us time to contemplate where we're at and why we're here. I LOVED the probing questions at the end of each chapter and if you take the time to answer each one, then your notebook should be full of insight into who you are and who you want to become. I highly recommend this book to High School graduates - even if you're not twentysomething, because it allows you a fresh look at your life and who God has created you. Really, this book is for anyone in a rut and in need of some lifting. Kara, what do you consider "adulting"? What does the word mean to you? Be explicit. I see a fair number of references to college after home-schooling, but is that realistic for most? Unless you're accustomed to a certain level of academic rigor, you'll quickly find yourself overwhelmed and discouraged. If it isn't too personal a question, what are your plans for the future?